It’s become California Chrome versus the field as we approach the 140th running of the Kentucky Derby, as the betting price on the Santa Anita Derby (G1) winner has dropped to 7-4 in the latest betting odds released by Bovada. Trained by Art Sherman, the colt is undefeated in three starts in 2014 and none of his rivals have run as fast as he has in his last two starts. He earned a 108 Beyer Speed Figure for his win in the San Felipe (G2) and then earned a 107 Beyer for his win in the Santa Anita Derby. Wicked Strong earned a 104 Beyer for his win in the Wood Memorial (G1) at Aqueduct on April 5, a new career top for the colt. The Jimmy Jerkens trainee is currently the 8-1 co-second choice in early Derby betting. Danza, who is the co-second choice at 8-1, earned a 102 Beyer for his upset win in the Arkansas Derby (G1) at Oaklawn Park on April 12. The colt pulled off the upset to the tune of 41-1- for trainer Todd Pletcher. Chitu earned a 102 Beyer for his victory in the Sunland Derby (G3) at Sunland Park on March 23. The colt will be saddled by three-time Kentucky Derby winning trainer Bob Baffert and is currently listed at 25-1 in early Derby betting. As it stands now, a field of 20 will line up on Saturday, May 3 for the Run for the Roses. Currently sitting at 21st in the 2014 Kentucky Derby Standings is Commanding Curve, who ran third in the Louisiana Derby (G2) in his last outing. The colt has 20 points and will need a defection to make it into the field. 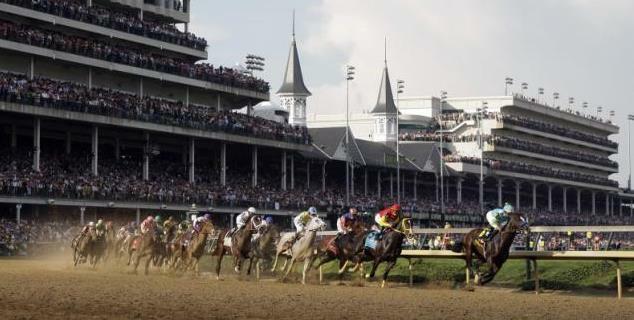 For a complete list of 2014 Kentucky Derby betting odds click here.